The kitchen was erected on Thursday. 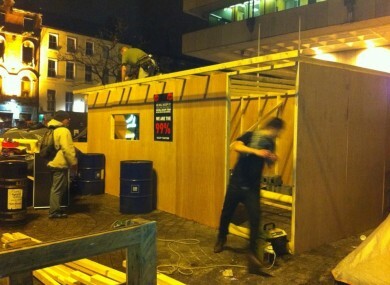 A WOODEN STRUCTURE which will act as a kitchen as the weather turns colder has been erected at the Occupy Dame Street site in Dublin city centre. The hut was built in a few hours on Thursday, and according to an individual from the site it will enable the campers to prepare hot meals. The individual, named Gillian, told TheJournal.ie that no permission was obtained to erect the structure. She said that security staff from Central Bank merely queried what its purpose was. According to Occupy Dame Street’s Facebook page Gardaí were asked to intervene, but refused. According to Occupy Dame Street’s Gillian the kitchen structure is not permanent and could be dismantled within minutes. She also said that a yurt has been erected at the camp and that people are planning to stay at the camp for “as long as it takes”. The money and materials for the structure were provided by members of the public. Meanwhile the Occupy Dame Street group has posted guidelines for those involved in the site saying that “while recognising the right to self-defence, the camp will attempt wherever possible to use non-violent techniques to diffuse violent situations”. The guidelines also advise that discrimination will not be tolerated, and that working roles within the camp are to be rotated. On Wednesday the group established a pop-up soup kitchen outside AIB on Grafton Street in the city centre, in an effort to raise awareness about the movement. The press office at Central Bank has been contacted for further information on the bank’s stance on the kitchen structure. WATCH: What’s Occupy Dame Street all about? Email “Occupy Dame Street builds wooden kitchen in front of Central Bank”. Feedback on “Occupy Dame Street builds wooden kitchen in front of Central Bank”.